This is a little late, but I thought I should post the pictures of my adorable children and what we did for St. Patricks Day again this year. 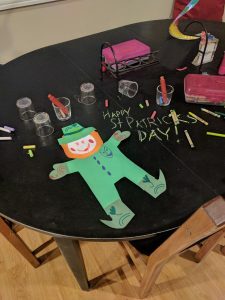 Our daughters preschool has an adorable tradition where they make Leprechaun catchers and spend two straight days trying (desperately) to catch a Leprechaun and get their gold. She made a trap again this year, and we used it at home. Unfortunately, the Leprechaun at home forgot, and had to come up with a quick fix this year. 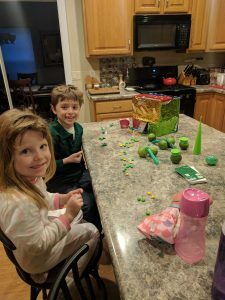 The kids found the green and yellow M&Ms set out on the counter. They were only there for less than 10 minutes, as they ate them all before I could make breakfast. Our daughters leprechaun she made at school. Looks like he grabbed the chalk and threw it all over the table. 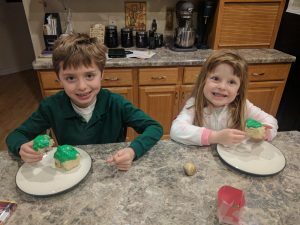 Cinnamon rolls with magic green frosting. I mixed the frosting in front of the kids and all they could see what the white of the powdered sugar. So it was pretty magic when I stirred and they saw it become green before their eyes. 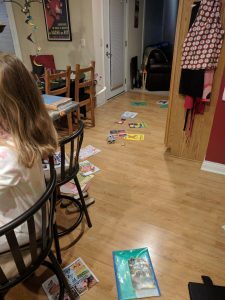 The mess all over the floor that the leprechauns left for me to clean up. 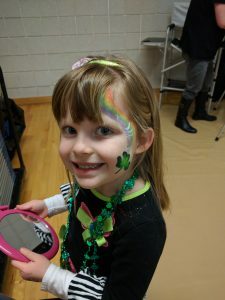 We were invited to an Irish Dancing show on St. Patrick’s Day. She got this adorable face painting.